I’m not one to condone cruelty to animals. If you’ve even caught one glimpse of an ASPCA commercial with Sarah McLachlan serenading you with guilt, there is no way that you could feel right about animal abuse. 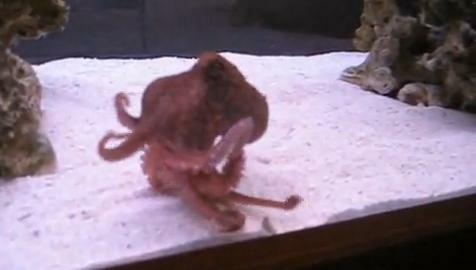 This video demonstrates a cunning octopus stalking a cleaner shrimp. The cleaner shrimp is clearly a gifted escape artist and the octopus is a highly skilled hunter, but you’ll have to watch to see the outcome. Nothing like watching a shrimp outsmart a human and an Octopus. that is animal cruelty – or did you not pay attention to when the shrimp was constantly poked at by the owner? I’m not sure I’d call it animal cruelty exactly. It would definitely be cruel NOT to feed the octopus, which only eats live food. If this was a feeder shrimp instead of a cleaner shrimp, I doubt anyone would give it a second thought. Saying animals that eat other animals shouldn’t be kept in captivity opens a big can of worms in regards to pet owner’s rights.